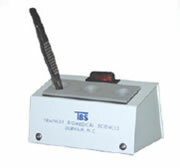 This forceps warmer is an indestructible, all metal, space saving unit. Three heated wells prevent wax build-up and allow for easy tissue orientation at the embedding centers. 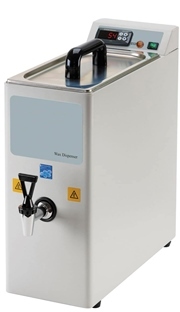 Dimensions: 5" W x 3¼" D x 3"
The Electrothermal Paraffin Wax Dispenser is designed for on-demand delivery of molten wax. It makes routine tissue infiltration and embedding easy and mess free. Designed for use with paraffin wax that has a melting range from 45°C to 65°C. it heats wax to a liquid state and provides convenient "wax on tap" for Histology and Pathology laboratories. 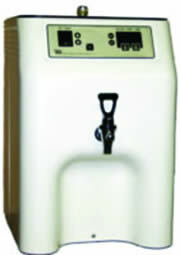 The Paraffin Wax Dispenser has a large 7.5 L capacity tank, for melting up to 6 kg of pelletized wax at a time. The innovative design of the instrument takes up minimal bench space in the laboratory. The Wax Dispenser has digital temperature control which provides accurate temperature control of the molten wax, and is coupled with an ultra-fast heating system for rapid melting of pelletized wax. The Wax Dispenser tap is heated via a dedicated heating system which prevents blockages and ensures an even flow of wax on-demand. Delivery of molten wax is via a non-drip lever tap with three settings (off, on-demand pull dispense, and continuous flow). The inner tank has a filter screen (0.5 mm mesh) fitted to prevent coarse particles from blocking the delivery tap. The Wax Dispenser is controlled via an intuitive digital control panel. The set temperature can be controlled using the up and down arrows on the control panel. The heater indicator will illuminate to show heater activity. The wax dispenser is designed to melt bulk quantities of pelletized wax in as quick a time as possible. When set at 65°C the instrument will take ~90 minutes to fully melt 5 kg of pelletized wax, with significant quantities of molten wax available for use after as little as 30 minutes. The equipment is protected by a miniature circuit breaker and a temperature cut-out. It will automatically turn off at 120°C to prevent overheating. The stainless steel inner tank is also fully insulated to prevent heat loss and to ensure that the outer surfaces of the unit are safe to touch. The powder coating of the stainless steel external surfaces include an anti-microbial additive to inhibit growth of bacteria. The convenient 2" x 2" (51 x 51mm) heated surface can be used for either "de-wrinkling" of paraffin sections or for the "rapid attachment" of fresh frozen sections. A quick touch of the slide to the hot plate will remove wrinkles and bubbles on your sections. You can also keep a unit on your cryostat to ensure solid attachment of frozen sections to the slide which prevents loosening of the tissue during agitation in hand staining. The unit measures: 4½" x 2¾" x 3¼" (114 x 70 x 82 mm). Electrical: 120 Vac, 60 Hz, 12 Watts. Temperature range: Ambient to 65°C. Our Wax Trimmer is an appliance for removing excess paraffin from embedding tissue cassettes.It is compact, tabletop design fits easily in any histology lab. Melted paraffin is shaved away. Collection tray stays in place by magnetic contact with the unit. The convenient PE disposable tray liner allows easy disposal of the runoff wax. No need to scrape out the collection tray. 6.25 Gallons of Liquid Paraffin on Demand! Holds 6.25 gallons of paraffin wax with clear lexan lid permits easy viewing of paraffin without contamination. High spigot accommodates large transfer vessels. The unit comes with microprocessor temperature regulation, built-in clock. Ambient to 65°C. Dimensions: 14"W x 15"D x 23"H (35.6 x 38.1 x 58.4 cm), weight 45 lbs (20.5 kg). Security – Advanced software & mechanical devices assure safety. The Paraffin Dispenser have been tested by a registered independent body to rigorous international quality and safety standards, and, have been found to be in compliance with UL, CSA and CE. This Flotation Workstation helps your tissue preparation easier, safer and more efficient. 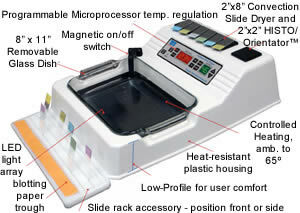 The unit comes with conveniently removable glass dish, scratch and chemical resistant plastic housing, microprocessor controlled electronics and a high contrast background for optimum specimen viewing combined with the HISTO Orientator™ for flattening sections and a Slide Dryer, all in one compact unit. The systems are now available in Low Profile 8" x 8" x 2¼" deep dish versions as well as for those labs wanting to float larger ribbons, 8" x 11" x 2". For those flotation bath applications not requiring the add convenience of Slide Dryer and HISTO Orientator™, the basic Flotation Bath provides all the functional need of the Flotation Workstation at the affordable price. The baths again come in two sizes, 8 x 8 x 2¼" or 8 x 11 x 2". The Floatation Bath and Flotation Workstation have been tested by a registered independent body to rigorous international quality and safety standards, and, have been found to be in compliance with UL, CSA and CE.